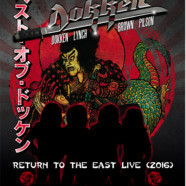 In 2016, the classic original line-up of Dokken featuring: Don Dokken, George Lynch, Jeff Pilson, and Wild Mick Brown reunited to play the world famous Loud Park Festival in Japan and one exclusive U.S. show in Sioux Falls, SD at Badlands. Fortunately for fans not in attendance at either show, cameras were there to capture the performance and now Frontiers Music Srl is set to issue “Return To The East Live (2016)” on April 20th! Today, a clip from the upcoming releases has been released. Watch the original lineup of Dokken perform their chart topping single ‘In My Dreams’ HERE.